Enjoy beautiful sunsets and ocean views while sitting on the lanai! Also, the view of world famous Diamond Head is inspiring! Watch the fireworks every Friday night from the lanai of this beautifully decorated 2 bedroom, 2 bath unit with full kitchen. The location is 'the best of both worlds', conveniently located 1 mile behind Waikiki. Far enough away to be out of the crowds and and when you want to, close enough to be part of the crowds and all the activities Waikiki has to offer. The unit is located right in front of the Ala Wai Golf Course. Watch golf from the lanai or walk over and play golf. You can walk to some of the island's favorite spots, Leonard's Bakery, Sam Choy's and more! Just opened recently a brand new Safeway store. Interested in cruising the Hawaiian Islands while you're there? Ask me! Just returned from our trip. We had a wonderful time. The condo was smaller than expected, but still plenty of room. We loved sitting out on the lanai. No air conditioning, but we didnt mind. Traffic was noisy, but, theres nothing that can be done about that. We loved our first trip to Hawaii. We hope to visit again someday. Thank you for sharing your home with us! The best. Walking distance to the grocery store, lots of restaurants, and Leanard’s Bakery. Small condo with great view & location. Easy to come and go; quiet despite being in Honolulu. One queen, other bedroom 2 twin beds. There are towels for the beach, and some snorkels, too. Wish the kitchen had a small microwave and a teapot for those of us who enjoy hot tea. Overall, enjoyed our stay...you will, too, and you'll find yourself relaxing on the lanai most of the time! Fantastic property and owner is great to partner with! We have stayed at this property for a number of years now and it’s always been great. Amazing view, close to so many amenities and the beach. The property had an incredible view, great locations, loved the cross breeze during the day, very clean, but no AC. Luckily we only had night that was really earn, other days we were fine! Amazing morning and night views to start the day and wind down the evening. Throughly enjoyed our stay in this comfortable condo. 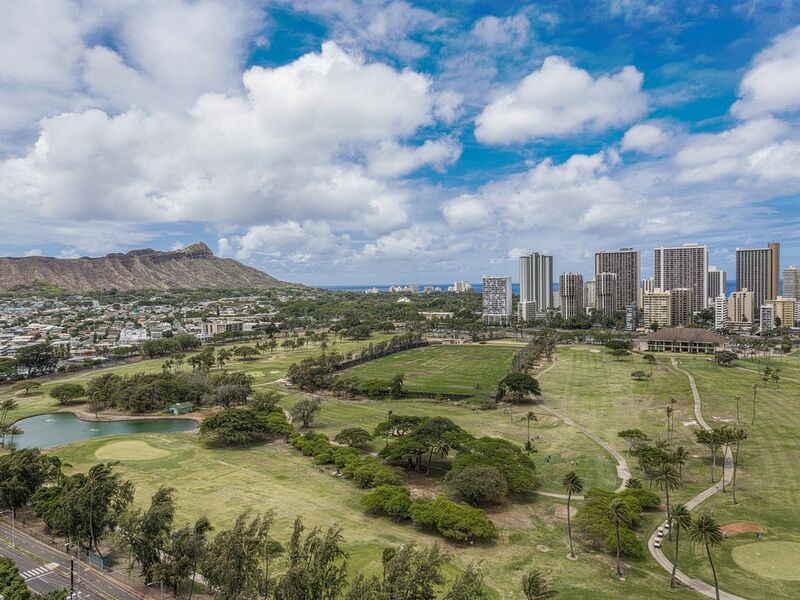 Take in a birds eye view of golfers making there way around the golf course below, and then take a short seven block trip to Leonards Bakery for Malasadas to get your day started. After spending the day at any of the many cultural, beach, shopping, or nautical attractions have a cool bevarged on the lanai to relax. Covered parking and a very secure complex are a plus as well.